A dance performance specifically made for toddlers and young children, Chiffonnade recently appeared at the 2018 Hilton Arts Festival. The piece was created by established French choreographer Michelle Dhallu of Carré Blanc Cie and has toured extensively in Europe and around the globe receiving glowing reviews. 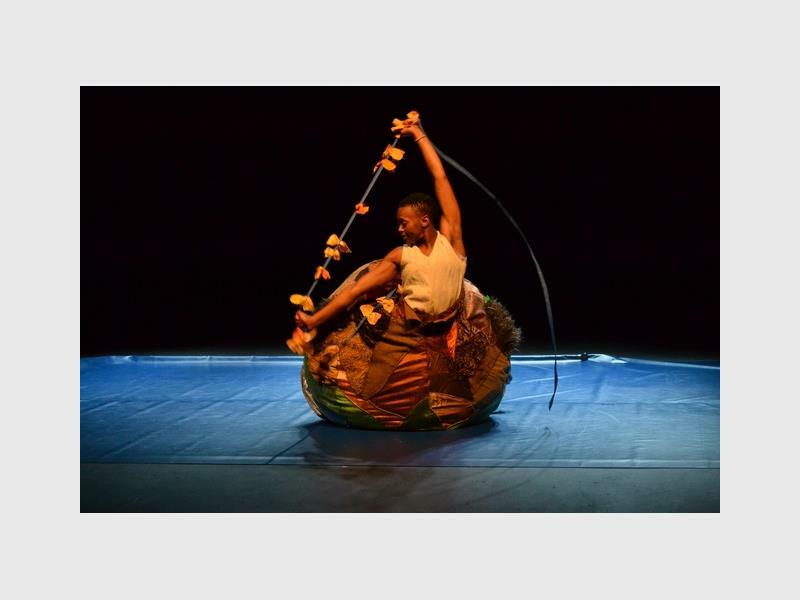 Partnering with ASSITEJ SA and Vuyani Dance Theatre performer Lulu Mhlangeni, Dhallu has recreated the work to provide a South African focus. The young audience watched in fascination as Mhlangeni appears covered from waist to feet in a large ball, made of different fabrics. Eyes widened further as the dancer disappears inside the ball and proceeds to roll around. Occasionally a hand, foot or arm is extended as the “being” inside the ball starts moving more extensively, giving the idea that we are watching a baby growing inside the womb. An arm appears again holding a rope and a child from the audience rushes over to grab it and out comes a long rope like an umbilical cord with bright ribbons tied on it. Once Mhlangeni emerges from the ball, she carries a pile of odds and ends. These and a long strip of blue material are set out to create a homestead next to a stretch of water. Real water then seeps onto the stage allowing the dancer to glide smoothly.